Varicose veins are veins that are swollen and bulge above the surface of the skin. They may be twisted and are often blue or dark purple. Varicose veins are most commonly found on the legs or feet, but they can also be found on the groin. 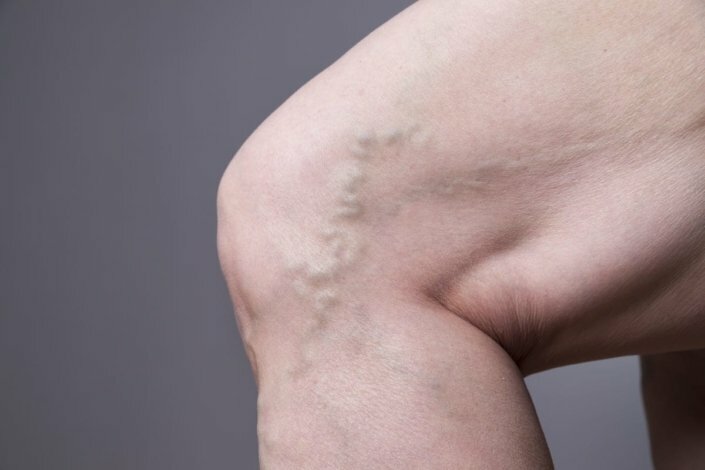 Varicose veins that you see are just under the surface of the skin. There are often deeper and larger varicose veins that you can’t see. Hemorrhoids are a form of varicose veins. Varicose veins can be painful. You may have a feeling of heaviness or tiredness in your legs. Your legs may ache or throb where there are varicose veins. You may also have swelling of your feet, ankles, and lower legs that gets worse throughout the day, but goes down overnight or if you elevate your legs. This swelling is called venous stasis. Sometimes, your skin may be itchy. In some severe cases, ulcers or blood clots may develop. If you begin to have any of these symptoms, let your doctor know immediately. Do varicose veins cause dangerous blood clots? Varicose veins do not increase your risk of dangerous blood clots. These clots form in veins deep inside your legs or arms. Blood clots can also form in varicose veins. These can be treated by your doctor with warm compresses or medicines. Veins return blood back to the heart so that it can be recirculated to the rest of your body. There are valves in your veins that open to allow the blood to flow toward the heart. In some people, the valves may stop working correctly, allowing blood to flow back down into the veins. (This often happens because the valves have stretched over the years.) Blood then pools in the veins, causing them to swell even more. The veins in your legs are especially vulnerable because those veins have to work against gravity to get the blood back to your heart. This is why most varicose veins are found in the legs. Your doctor often will be able to diagnose varicose veins simply by examining your legs. Other times, your doctor may order tests to look at how well your blood is flowing before diagnosing you. Can varicose veins be prevented or avoided? Genetics: Varicose veins tend to run in families. Gender: Women are at greater risk of developing varicose veins. Pregnancy: Hormonal changes, pressure from the uterus, and increased blood volume make varicose veins common during pregnancy. Age: The risk for varicose veins increases with age. About 50% of people over the age of 50 have varicose veins. Obesity: Being overweight puts additional pressure on your veins. Job: If your work means you have to stand for long periods of time without moving around, you are more likely to get varicose veins. Raise your legs while you are sitting. If possible, keep them above the level of your heart. Your doctor may recommend that you wear compression stockings. These are stockings that provide gentle, consistent pressure. This will help keep blood from pooling in your legs and reduce swelling from venous stasis when you are sitting or standing. Compression stockings can be found at pharmacies and medical supply stores. If your symptoms don’t get any better with at-home care, or if you don’t like the way varicose veins look, there are more invasive treatment options available. These include surgery, laser therapy, and injection therapy. Your doctor can recommend which procedure would be the best option for you. If you have varicose veins, know that you aren’t alone. It’s a common condition, especially among women. If you do not like the way your legs look because of varicose veins, you can opt for treatments that should cause the vein to fade or even disappear. What is the likely cause of my varicose veins? Will varicose veins go away with treatment? What lifestyle changes can I make to help get rid of varicose veins?